Two days ago Donna and I left Big Bear Lake in a car rental and drove the two hours back to our home. It was bittersweet. We picked up our mail, went to the grocery store and took care of some chores around the house. We love our house and where we live … but we wanted to be on the trail together … and Donna couldn’t. It was nice to sleep in our own bed. The next morning Donna had an appointment with her orthopedic surgeon – he is great and had done Donna’s back surgery thirteen years ago as well as a couple arthroscopic knee surgeries. As expected he order an MRI of Donna’s right knee. Donna will get that done today. I was anxious to get back on the trail and not lose any momentum, so I had arranged for a one-way car rental back to Big Bear. Yesterday I had switched out some gear to accommodate a solo hiker – one person tent & smaller cook system. This morning I was up at 6am and in the car by 6:45. I arrived at Big Bear a little after 9am, returned the car and Ubered to the trailhead. I was hiking up the Cougar Crest Trail at 10:15 (2.2 miles) and had re-connected with the PCT in one hour. I did run into a medium sized rattlesnake on the Cougar Crest Trail but he was into the bushes before I could take a photo. Shortly after reaching the PCT and heading north I had nice views of Big Bear Lake – it would be the last time I would see the lake. 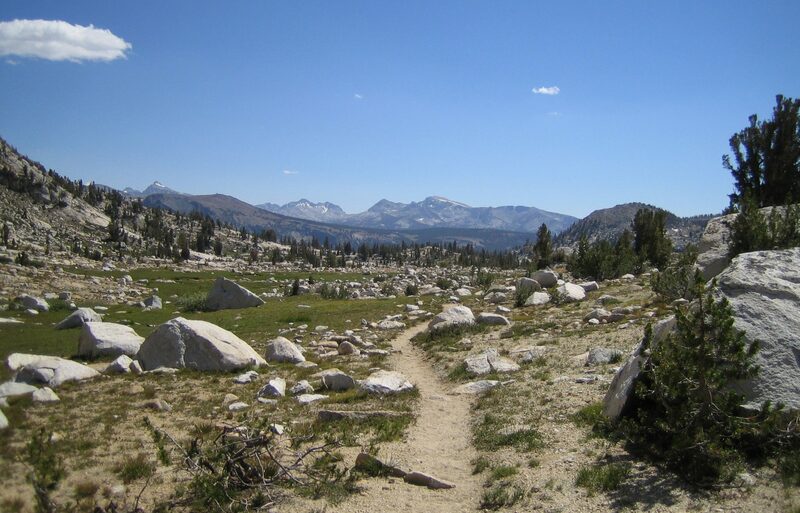 After a few miles on the PCT, I got into a section that was not that pretty, which is unusual on the PCT. It appeared to be a section where there had been a previous fire as well evidence of mining activity. It wasn’t long before I reached a more scenic part of the PCT and enjoyed forward-looking vistas, trailside pine cones and ducks in a pond. I reached Holcomb Creek and found a campsite by 5:30. ← Day 21: Zero Day; Donna’s Knee!!! Best Wishes Todd on going solo. I hope you don’t get too lonely on the trail! I know that Donna’s goal is to get back on the trail as soon as possible so you won’t be lonely long! Enjoy and be safe! You look like you are back in your element. We enjoy the pictures so keep them coming. Happy hiking, Todd. Hope Donna can rejoin down the road. Sad that Donna is home in your awful neighborhood of CDM, but happy you got to sleep in your own bed before the next phase.! Love that you are continuing on and hopefully she can join you again. Hello from Idyllwild! Thanks for the updates and sorry about Donna’s knee….bummer. Keep on keeping on!! !